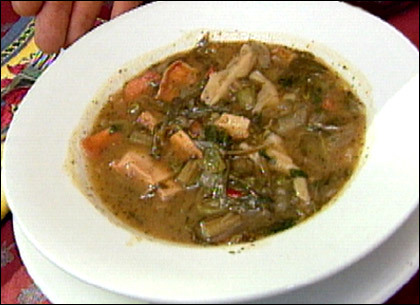 This vegetarian gumbo can be considered "faux" for two reasons: because of the mushrooms that masquerade as seafood (or meat/chicken), and also because of the mucilaginous wild greens that substitute for okra. 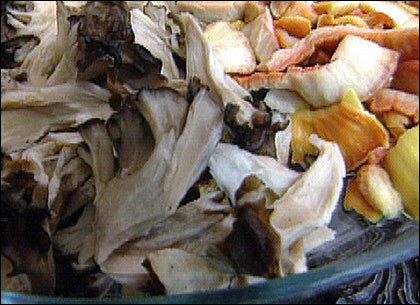 If you are short on mushrooms, or to make a heartier soup, you can use seafood, meat or chicken instead of some of the mushrooms. In a heavy Dutch oven or any large, thick-bottomed cooking pot combine flour and oil until smooth. Cook over medium high heat for 5 minutes, stirring constantly. Reduce heat to medium. Cook and stir about 20 minutes more, or until mixture is reddish brown (the color of a penny). Add onion, Burdock, green pepper and wild leeks; cook and stir for 5	minutes. If you are using previously blanched and frozen greens, wait to add them with the mushrooms and parsley in the next step. Add chicken broth, water, greens, paprika, salt, oregano and pepper. Bring to a boil, then reduce heat and simmer covered for 10 minutes. Add mushrooms and parsley. Simmer uncovered about 5 minutes more or until mushrooms are done. Remove from heat. Russ Cohen notes: Some of the wild ingredients we used (Burdock flower stalks, Pokeweed shoots and Milkweed buds) are in season in late spring and early summer, and the mushrooms are not available until the summer or fall, so it's likely that one or the other of them will be previously cooked and frozen. Adjust cooking times accordingly. Young and tender portions of both Sulphur Shelf and Hen of the Woods mushrooms can be frozen raw and then simply thawed out before cooking. And finally, a word of caution: When foraging for wild ingredients, you should always find an expert, or someone with foraging experience, to accompany you. Some wild plants and mushrooms are poisonous and can be harmful or fatal if eaten. For more information on wild mushrooms in the Boston area, visit the Boston Mycological Club. For more information on local mushroom clubs throughout the country, visit the North American Mycological Association.